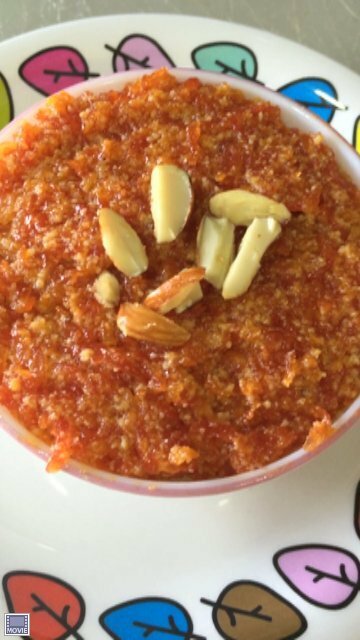 One of my earliest memories of high school is mom making copious quantities of Gajar Halwa & Vangibhath whenever my friends came home for lunch or brunch or supper during winters. We would all sit in one large circle and gobble up the goodies even before mom could lay the dinner table. That kind of carefree days may be almost over , but those memories linger on. 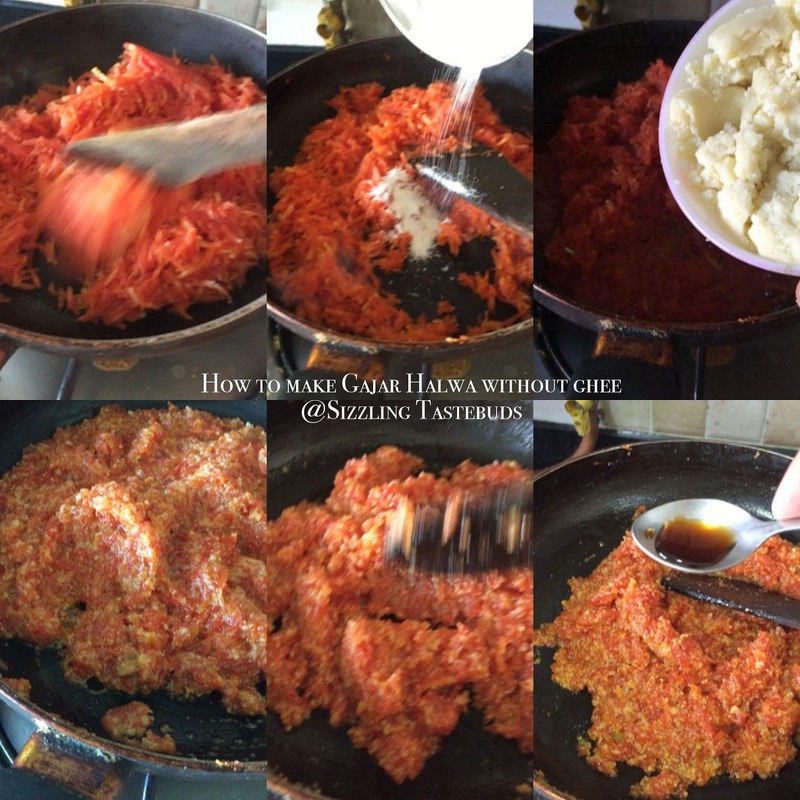 This is one of the dishes that mom taught me to make from scratch & while growing up, the Delhi carrots (red variety) was a treasure to be saved for the choicest of halwas (in fact I remember using the regular orange carrots only for this halwa), but after moving cities, I do have access to these red carrots during 3-4 weeks of winter. My elder kid particularly likes this and eats it with relish whenever prepared. So, winter (or spring), make it anytime it fancies you. There is a pressure cooker method which also yields great results. But for now, I am making it the traditional way using a pan. And this method does NOT require any ghee. Gaajar Halwa without ghee ?? Read on to find what substitute works in place of ghee to make this a decadent dessert for Holi, Diwali or pretty much most Indian festivals. Wash, lightly peel (or just scrub well), grate the carrots. Now add the powdered sugar, mix well (Tip : I add only 2/3 of the sugar first, taste it after 5 mins and then add the rest if needed, we like our desserts to be mildly sweet, so do a taste test if required and add in parts). After adding the final portion of the mawa, dont leave the pan unattended. Switch off the flame, add in vanilla essence if using. Sending this to BM 73 under Holi / valentine day treats. Valentine's Day was just around the corner ; however there's always an excuse to indulge in some sweet or mithai isn't it ? 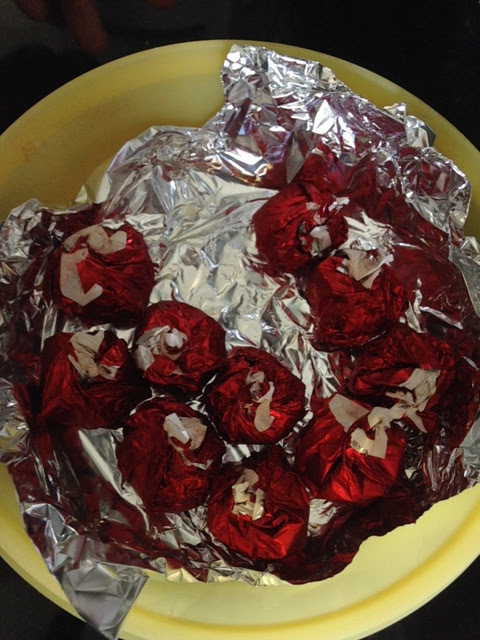 Today's is a perfect gift for my own little Valentines - my two little girls (well they are no more little but the worried mommy in me says they'll fly away before it's long ), so here am savouring all my moments with them ..
One of them were these cute nut filled home made chocolates that I had made earlier. When my cousin posted here earlier this week on her blog , it triggered a search that like her I also have fond memories of munching on fruit n nut chocolates from Cadbury's while growing up..
Well, no issues. 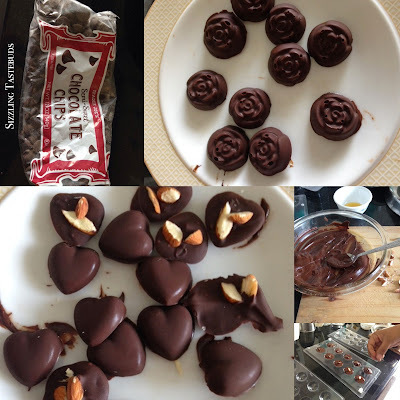 If they are MY valentines, they have all the right to do so :) needless to say, these make perfect gifting too ( as is the rage now for homemade chocolates with fillings ranging from caramel to mint to Cointreau) ! Make a batch and watch them disappear ! 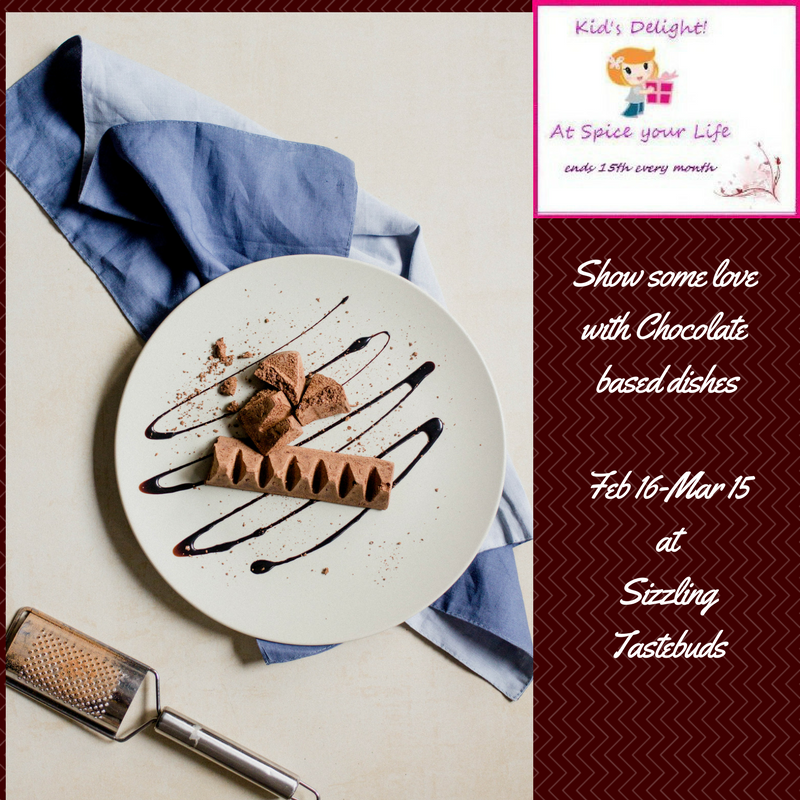 Sending to my own event Kids Delight - Chocolate Dishes and BM 73 under Holi / valentine day treats. When fully melted , take it off the flame and quickly mix in the butter and chopped roasted nuts. Give the mould a firm tap on the kitchen counter to remove any air bubbles. Simple, creative, elegant,delicious - chocolate fits into more than these categories. No rules - Its simple as A,B,C. Although I prefer fresh entries, archived entries updated+ the logo are also accepted - make sure archived entries are appended with the details above to qualify. Look forward to your love, and your entries..
Onion - 1 large - minced fine or sliced thin. If you dont have ready roasted peanuts, roast the peanuts with their skin on on low - medium flame till they slightly brown and the skin begins to peel off. Transfer to a large plate, cool and rub the peanuts against a coarse towel to peel the skin off. If you have ready shelled roasted & unsalted peanuts, skip the above step. In a pan, add oil, saute the onion, garlic till pink. Now add the chillies and saute. Cool. 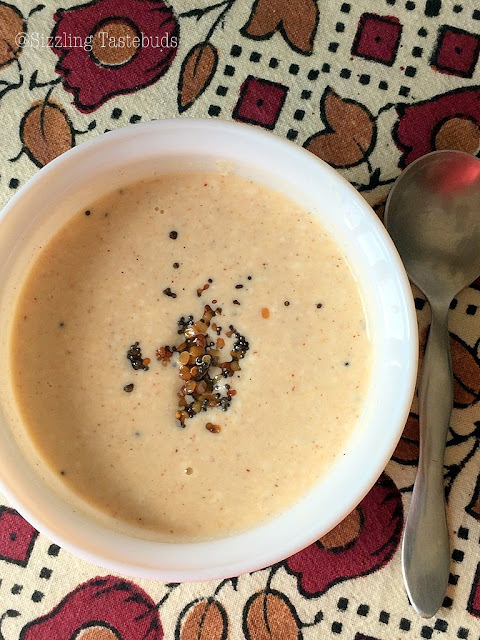 Blend all ingredients (peanuts & onion - garlic- chilly mixture) except curd into a smooth semi dry powder. Add water (2 TBSP) and blend to a smooth paste. Now add the curd and churn just once. (I prefer adding the whisked curd to the ground peanut chutney Once the chutney is transferred from the blender). Mix well. 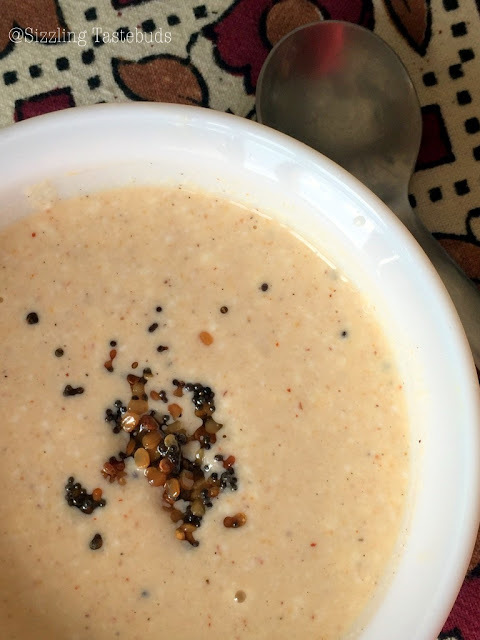 Prepare tempering with oil, mustard seeds, hing and Urad dal. The second in the "Flavours of India" series this week is my former neighbour aunty's recipe. This is a no fail recipe and I especially loved the flavours that used to emanate while digging into this dish. This post is surely making me nostalgic - as Mahalakshmi Aunty (the neighbour) used to make this and send over a generous portion of the dish over to our house. In fact, we didn't live as neighbours, it was more like two families living in adjacent houses. 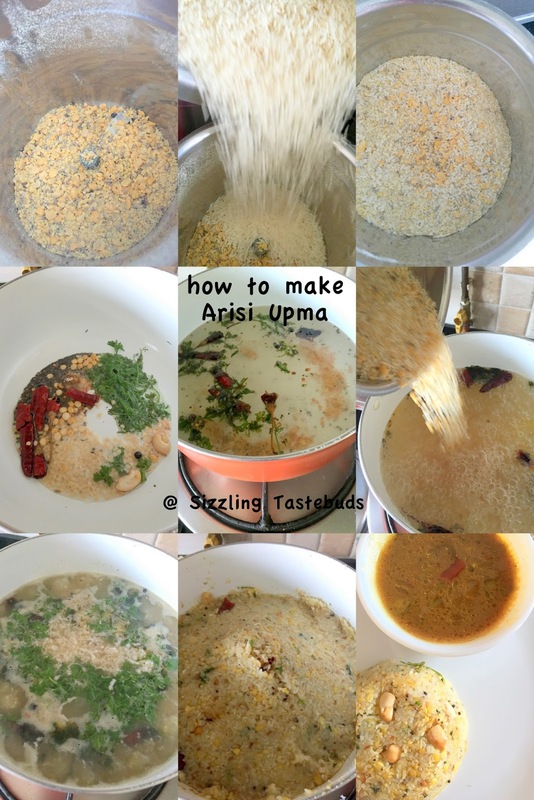 Aunty's daughter R virtually grew up in our house, and her brother and myself were classmates..
Hope you are enjoying the series this week of "Flavours of India" with Arisi Upma posted yesterday. Nalagri Bhath is predominantly made by the Hebbar Iyengar community - a subject of tamilians living in Karnataka. This is similar to the sambhar powder and the vangibhath spice mix, but with little twists on the way. I shall post a detailed recipe of making this spice powder soon, but till then enjoy the recipe. This Nalagri powder is used to make Sambhar and also to spice up most rice dishes dotted with vegetables similar to Vangibhath. Other vegetables that can be in place of cabbage (or along with cabbage) are potato, peas, french Beans, methi leaves (fresh fenugreek leaves), capsicum (bell pepper), brinjal. Vegan . Satvik and Gluten Free dish | Main course / dinner Ideas. Cook one cup of rice till done. fluff it in a large plate and keep aside. In a pan, heat oil. Add tempering, once dal turns brown, add the cabbage. saute well. Add turmeric and salt and sprinkle little water, cook and cover. Once cabbage is crispy yet cooked (let it not become mushy), add the peas, the NaLagri Powder, and mix well. Let this come to room temperature. Now add the grated dry copra, rice. Mix gently without breaking the rice grains. Serve immediately as is or with a bowl of yoghurt or some pickle (Its quite spicy so goes well on its own). Makes an excellent lunch box option. 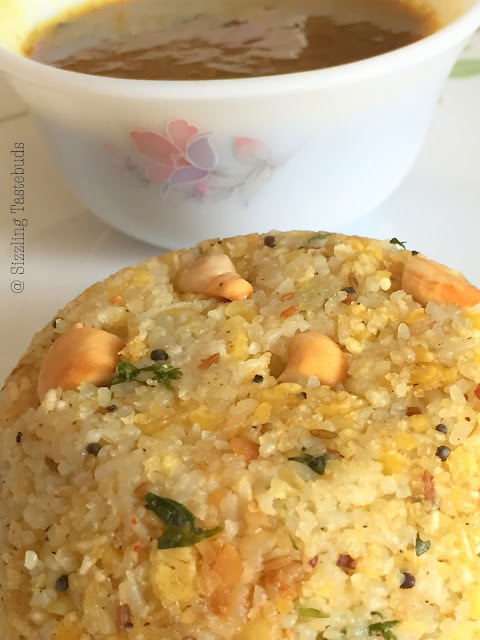 Today's post of Arisi Upma (Broken Rice Upma) comes from my MIL's kitchen repertoire. This was one of the earliest dishes she made for us while visiting us right after our marriage. Apparently, she makes Rava Ladoo, Jaangri (a Urad dal based sweet) & many other Kuzhambus awesomely well, but this recipe has stayed with me. There are different ways of making this, but this is to document her style. We are running "Flavours of India" this week presenting 3 different dishes that dont appear on restaurant menus but are mostly made by homecooks. This is a breakfast as well as a evening tiffin dish. Its spicy on its own, and must be eaten hot. We make it mostly on weekend nights in place of an elaborate dinner or sometimes for a Sunday evening tiffin (early supper) and skip our dinner as its very filling . Accompanied here is this Gothsu (Tamarind based spicy dip) thats used as a side dish for Ven Pongal or Rava Pongal. It can also be had with any Kuzhambu variety. Off to the recipe, now ! Follow the steps enclosed for a yummy Upma :) Hope you also make this and enjoy it..
Prep time : 5 mins | Cooking Time : 20 mins | Serves : 2 adults generously. 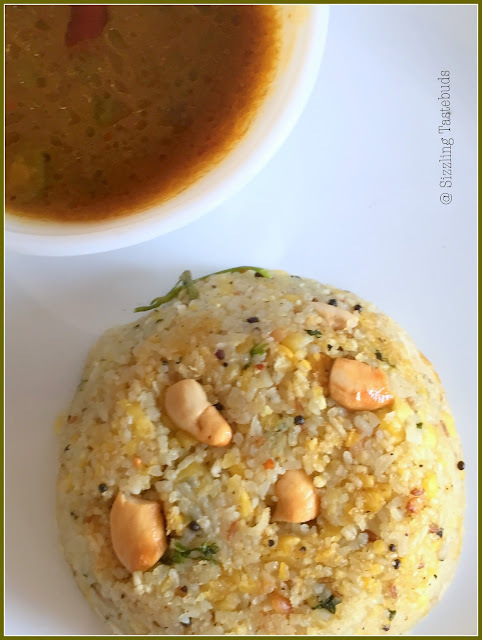 Cuisine : Tamilnadu (South Indian), Course : Breakfast or evening snack / Dinner alternative. In a spice grinder, pulse the dal with the jeera and pepper corns a couple of seconds into a slightly broken consistency (take care while splitting them else it would become a smooth flour - we are just breaking it into two keeping it very coarse). Add the rice now & red chillies and just pulse it once for 1-2 second. You would get a heterogeneous mixture of rice, dal, spices. Sieve it once to remove any flour material and keep aside. In a non stick pan or any deep bottomed pan, heat oil (sesame oil or Nallennai works best here). roast the cashews till golden brown, remove with a slotted spoon. Now quickly add the dals and mustard seeds and saute till mustard splutters and dals brown a bit, then add asafoetida, curry leaves, the hot water , grated coconut & salt. When the water boils for 1 min more, slowly add the rice-dal-spice mixture in a steady stream and keep stirring the mixture like you would for Upma. Mix quickly before it gets lumpy, close the lid and let it cook for 10-15 min on a very low flame (Rice takes quite some time so watch intermittently). Once done, mix well, add the ghee (if using), fried cashews. mix once more and serve hot. I love this personally with a bowl of yoghurt or this Gothsu. Sending to BM 73 under "Flavours of India"
How often have you rushed to email the author about a book that's appealed to you ? How often has each line written in those pages spelt out "Nostalgia" in every nuance. Well, it has happened to me, now with a Paper Boat Drink Company (aka Hector Beverages) which so dearly sponsored this Book - Half Pants, Full Pants , written by Anand Suspi. There's not one place throughout the book where I felt bored. Rather, could relate to the incidents when 'he' came home and how he was treated like royalty, wrapped in cellophane paper and thermocol and not used at all (I am not going to spoil the fun if you are reading the book), or those instances of Mara Kothi (monkeys on the tree) game which was my childhood favourite. Or the fact that life growing up back then didn't necessarily mean gadgets - It meant paper kites, living in a colony (which also taught kids a LOT about tolerance and social mingling - something for which we have 'courses' today (sic!) ), eating off a dining table (or not even that) that was meant to serve you for a lifetime, cleaning up your own mess at home / or with friends (no gender bias there), or even perhaps the simple joys of listening to a local orchestra playing during the festival and wanting to be a drummer. In all this, the author has captured the essence of living in a railway colony and the punctured tyres, the Kalla-police (games that we played too! ), experimenting with different dangers , calling your friends by their nicknames (without degrading them)... ah these were somethings that stayed in my mind. If I (need to) have just one negative (hey, its a (paid) book review, remember ?? ), it was just that it ended too quickly... I needed more episodes of the author's quarrels / showdowns with his brother (remember quarrel no 540!!) , more instances of the simple Middle class household happenings (which could have happened in ANY middle class house of Karnataka - Bangalore / Mysore / Shimoga during those years), and then we cuddle up for more time with the book with a paper boat drink (perhaps next time, the chikki can be replaced with a crate of Paper boat drinks :p) and switch off to nostalgia !! Thank you Mr Anand for your insightful writing, thanks to Balki for that wonderful foreword, its indeed a "Malgudi-reborn" kind of a book. The ones that lull you back to innocence, just like Paper Boat Drinks :-) Look forward to more such books by Mr Anand / Paper Boat !